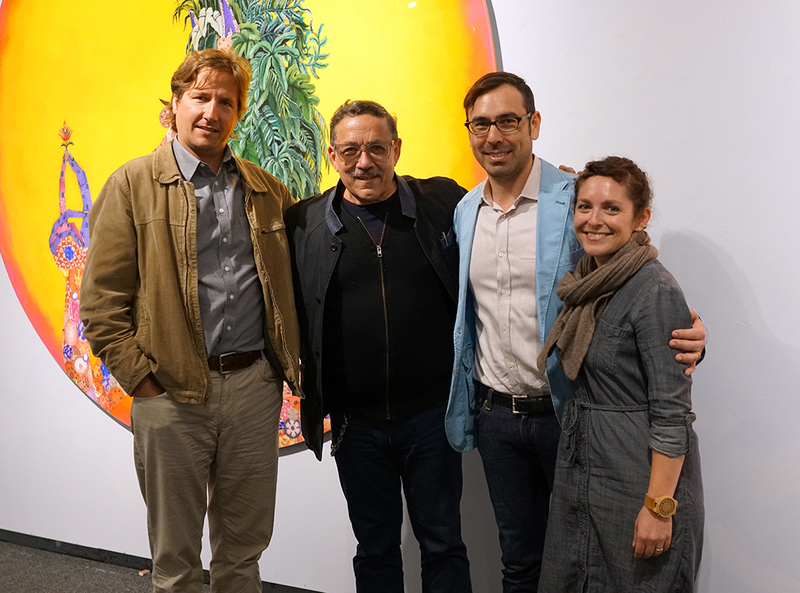 FSU Art History will be represented at the 107th College Art Association Annual Conference by department faculty Lynn Jones, Paul Niell, and Michael Carrasco, alumna Lesley Wolff, Ph.D. candidate Gabriela Germana, and doctoral student Sarah Mathiesen. The conference will take place in New York City at the New York Hilton Midtown February 13–16, 2019. The College of Fine Arts will host a reception for FSU attendees, alumni, and friends on Thursday evening, February 14 (details below). 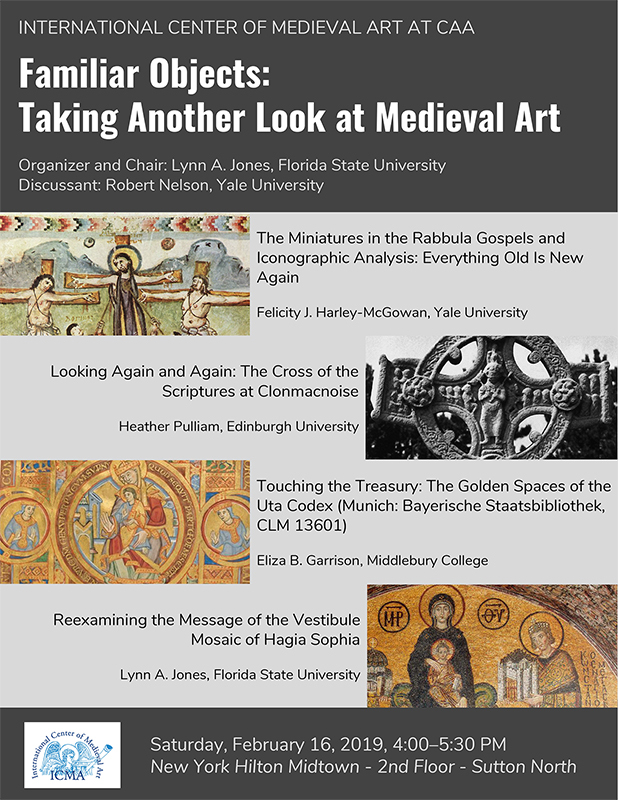 Dr. Lynn Jones has organized and will lead the session Familiar Objects: Taking Another Look at Medieval Art on Saturday afternoon, February 16. The session, sponsored by the International Center of Medieval Art, will feature five speakers: Felicity J. Harley-McGowan (Yale University) and Eliza B. Garrison (Middlebury College) will investigate the miniatures in the Rabbula Gospels and the Uta Codex, respectively; Heather Pulliam (University of Edinburgh) will focus on the Cross of the Scriptures at Clonmacnoise; and Prof. Jones will present “Reexamining the Message of the Vestibule Mosaic of Hagia Sophia.” Robert Nelson of Yale University is the discussant for the session. While new methodologies and interpretations of medieval culture have emerged, the scholarly narratives of many well-known medieval objects have gone unchanged. The speakers in this session will marry these innovations to such objects, all highly visible in textbooks, exhibitions, and course lectures. The panel brings together Late Antique, Insular, Ottonian, and Byzantine specialists. Dr. Paul Niell and alumna Lesley Wolff (PhD ’18) are co-chairing the session Caribbean Temporalities in Contemporary Art and Visual Culture on Wednesday morning, February 13. This panel brings together papers by distinguished scholars of Caribbean and African Diaspora art history and visual culture, including Erica James (University of Miami), Jerry Philogene (Dickinson College), and Anthony Bogues (Brown University). Lesley will also give a paper in the same panel on the work of Haitian American artist Edouard Duval-Carrié, co-authored with Dr. Michael Carrasco, titled “Authentic Sweetness: Temporalities of Caribbean Consumption.” Edward Sullivan of the Institute of Fine Arts, NYU, will serve as discussant. This panel considers the current horizons of Caribbean art history, specifically how the socially-engaged praxis of decoloniality raises issues of temporality, place, and belonging. The work of such contemporary Caribbean artists as José Bedia, Miguel Luciano, and Edouard Duval-Carrié has led art historians to investigate history as a discursive genre and memory as a persistent force in the region, paying particular attention to figural conventions, materials, and media. Dr. Niell will also be presenting a paper in another session titled What is American? Exploring Iberian Contact Zones in the “New World.” Dr. Niell’s paper, “Creole Houses and Spaces in Colonial Puerto Rico,” examines the material, social, imperial, and environmental factors contributing to the evolution of Creole domestic architecture in Puerto Rico, principally in the late eighteenth and nineteenth centuries. The Florida State University College of Fine Arts invites Florida attendees, alumni, and friends to a CAA reception on Thursday evening, February 14, 5:30–7:30 pm at Faces & Names, 159 West 54th St, New York. The reception is co-hosted by the FSU CFA with the University of Florida and the University of South Florida.